Finding a foundation is never an easy task. I spend forever in shops trying to swatch as many as possible but still seem unsure of what to buy. Due to how pale and pink my skin is, I have trouble finding a light shade that'll even out the pink without making me look like a ghost. After quite a bit of swatching in superdrug on Saturday, I couldn't resist trying the new MUA professional matte foundation for £2 and I'm so glad I did! The shade has enough yellow tone to even out some of the pink in my skin. It is what I've been looking for shadewise - a non-orange and non-ashy shade, that's sheer enough to blend with my skin whilst providing decent coverage. 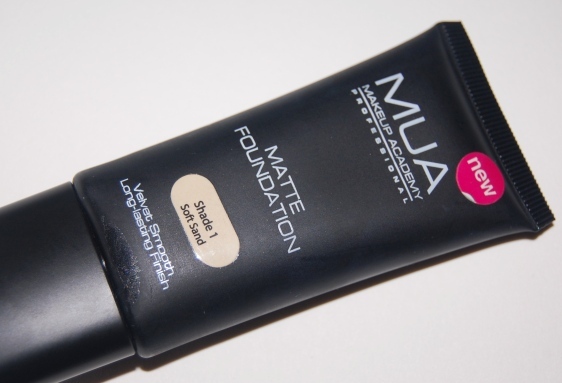 The consistency of this foundation is quite thick, but it doesn't settle into every dry area of my combination skin and similarly it doesn't instantly dry patchily on my skin. It takes a while to blend in due to the thick, slightly tacky consistency to apply it (I use my hands to apply foundation 99% of the time) but once it's on, it has great coverage without making me look like I'm wearing a mask. 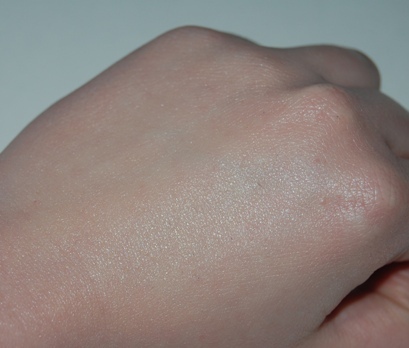 I was surprised by how light it felt as one major problem with cheap foundations I've swatched seems to be the strange muddiness and dodgy formulas. I didn't find it drying but I would note some shine and fading (mostly under my eyes where I normally conceal) after about 6 hours of wear. Also, despite the fact that it was quite a thick formula, I didn't need immense amounts of the product because it could be blended before drying out. I don't mind the fact that it wasn't as matte as I was expecting but I would say for those with particularly oily skin, it might not be the best idea. 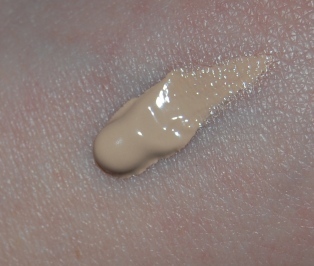 Above is a swatch of the foundation straight out of the tube and below it is blended right out. So here are the all important before and after photos. Firstly, I'm going to warn you outright that I'm wearing absolutely no makeup in this photo. Zilch. Nada. So there it is, and I even have a spot for the occasion! Aren't you all lucky. Now, I'd like you all to compare this monstrosity to the photo below, where I'm wearing only MUA's professional matte foundation in soft sand. This product boasts it is "velvet smooth" and will leave a "long-lasting finish." I have to say I was seriously surprised to see such a difference. 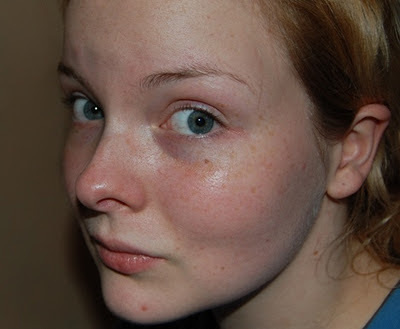 The redness in my cheeks and around my nose has been reduced (which is something that I suffer from all year round). Also, the dark shadows under my eyes have been pretty considerably reduced. While I do look a little shiny, I actually don't think I look like I'm even wearing makeup. 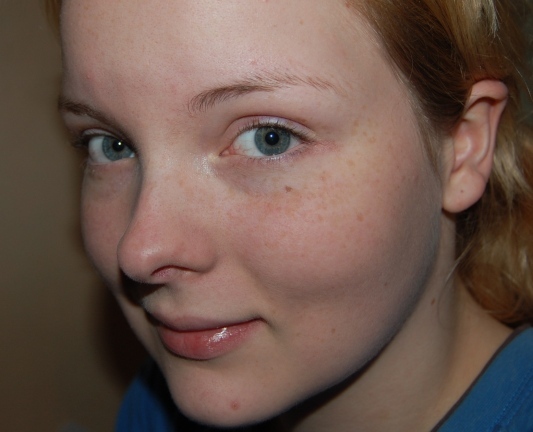 There are still quite a few freckles and admittedly that great big blemish visible, but I think that this foundation covers what I seek to cover. While I wouldn't describe this effect as matte, it was definitely smooth and I'm seriously impressed for £2! Now this last photo is just me with a dusting of collection 2000's powder over the top which is my every day cheap powder product. 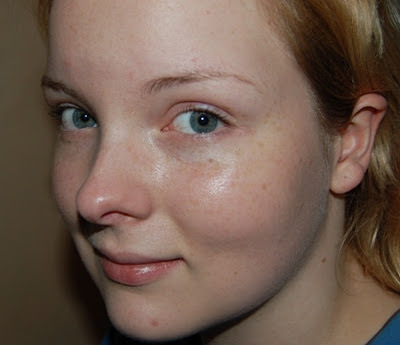 Instantly the dewiness is toned down and my skin looks matte and even. While I normally top up my foundation and powder combination with a touch of concealer (yes spot, I'm looking at you) I think that for £2 this is great. After a day of wear today, I can probably say that it did probably fade somewhat around my nose and undereye area but I'm not adverse to topping up with powder to mask shine. For £2 I think this is a nice and light formula and cheap alternative in a sea of dodgy foundations. @Grace I am not kidding, I love it. And thank you! @Karen Eee thank you! I hope you can try it, it's been great for me.